Heat oven to 350°F. Grease bottom only of 9x5- or 8x4-inch loaf pan with shortening or cooking spray. In large bowl, beat sugar and butter with spoon until light and fluffy. Beat in eggs. Stir in bananas, milk and vanilla until well blended. In small bowl, mix flour, nuts, baking soda and salt. Add to banana mixture all at once; stir just until dry ingredients are moistened. Pour into pan. Bake 50 to 60 minutes or until toothpick inserted in center comes out clean. Cool 5 minutes; remove from pan. Cool completely, about 1 hour. Wrap tightly and store in refrigerator. If you’re short on super-ripe bananas, slow roast what you need in a 300°F oven, unpeeled, for about 40 minutes. Peel and mash. 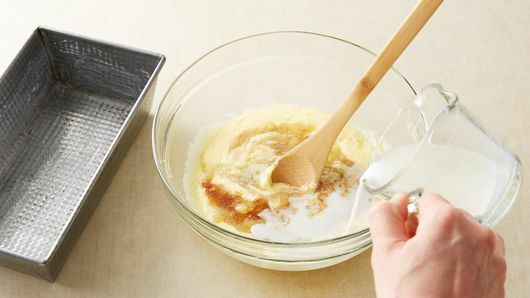 It’s important to grease just the bottom of the loaf pan, so the batter can climb evenly up the sides of the pan to create a nicely rounded top crust. 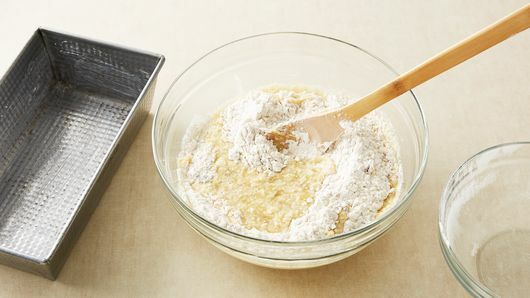 And remember to just mix up the batter until the dry ingredients are moistened—a few streaks of flour are okay. Overmixing will cause the loaf to be dense, with tunnels running through it. When the loaf is fully baked, the top should crack—that’s a hallmark of moist-crumbed quick breads. Use this base recipe as a starting point for other snack loaves. For Applesauce Bread: substitute 1 cup applesauce for the mashed bananas and stir 3/4 teaspoon ground cinnamon into the flour mixture. Berry-Banana Bread: stir in 1/2 cup sweetened dried cranberries into the flour mixture. Banana-Chocolate Chunk Bread: Stir 1/2 cup coarsely chopped semi-sweet chocolate bar into the flour mixture, skipping the nuts. Our favorite dessert recipes are ones that can pass for breakfast, too. Extra points if they use ingredients you probably already have on hand! That’s why banana bread is one of our staples. It’s so versatile, so easy and arguably, the most popular type of quick bread out there (though we love a good loaf of pumpkin bread, too)! 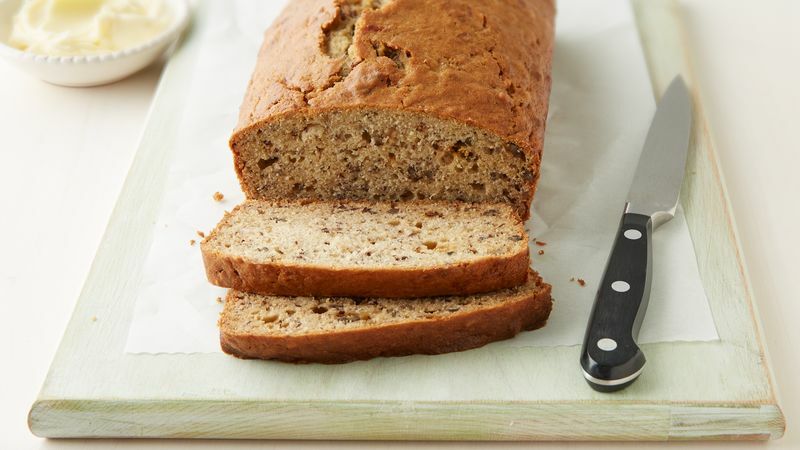 All you need are a few pantry staples and some ripened bananas to make this moist, cake-like bread. If you’re bananas for banana-flavored treats, let your bananas get extra-ripe before baking, with brown skin and fall-apart peels. 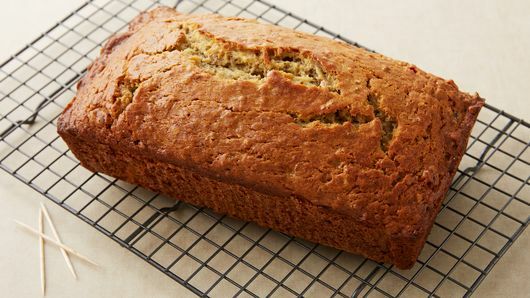 Then work them into this no-fail banana bread recipe, or try your hand at some of our other banana desserts! Don’t have any extra-ripe bananas on hand? Toss them on a baking sheet and into the oven at 300°F, peel and all, for about 40 minutes. Banana bread is so customizable, there’s a version for everyone! Try adding mix-ins like walnuts, chocolate chips, Nutella or peanut butter for an easy upgrade (you can thank us later). If you’re looking to make some healthier ingredient swaps, try using whole-grain flour or subbing yogurt + applesauce for the oil. Or, just stick to this foolproof recipe for guaranteed success!